Security footage shows roughly 75 African-American hoodlums storming Jewish store in Crown Heights; NYPD: no hate crime. A shocking anti-Semitic attack was caught on security camera film this Saturday night in New York's Crown Heights neighborhood, as roughly 75 young African-American hoodlums vandalized a Jewish store while shouting "Heil Hitler" according to witnesses. The attack took place around 9 p.m. on Saturday night at the Gourmet Butcher on Troy Avenue, near Carroll Street, with vandals breaking into the store owned by Yanki Klein and throwing products on the floors. According to CrownHeights.info the gang of vandals previously opened up two schools buses and tried to release their brakes, causing police to be called - but not before they had reached the Gourmet Butcher. 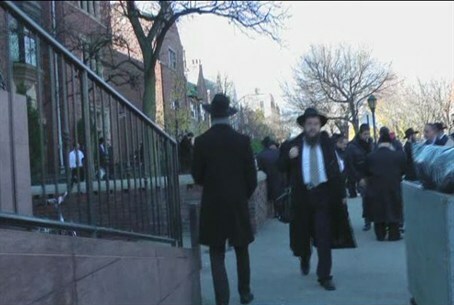 Klein complained to the local news source that this was not the first time he has been targeted by anti-Semitic hoodlums, saying he has complained to police on numerous occasions to no avail. "These kinds of kids come by my store and yell ‘Heil Hitler,’ or steal things that are on shelves near the door," said Klein. "I've asked the police to put an officer on my corner many times, but I feel like I am being ignored and these ‘minor’ problems keep happening." "And now this, it is a miracle that they did not manage to get all the way into the store, otherwise I would have been dealing with much more damage or worse, heaven forbid," added the Jewish store-owner. Klein added that his 23-year-old brother was standing in the doorway when the vandals stormed in, and in the process was assaulted in an attack not caught on film. "One of the guys that ran towards him, he punched him in his face," Klein told CBS 2. The news site said police confirmed assault or vandalism complaints that night, but said the attack is not classified as a hate crime. Brooklyn Borough President Eric Adams and other local leaders are to hold a gathering on Tuesday to denounce the incident, noting on the recent surge of anti-Semitic activity in the area. Adams remarked "there was an attack of a prominent Jewish leader, he was attacked at Barclays Center, and we want to really use this period during the Sukkot holiday to really focus on we cannot have hate in any form in our borough." Adams likewise took part in a gathering of leaders in August to condemn two other anti-Semitic incidents, namely a "knockout game" assault on a nine-year-old boy, and the murder of 60-year-old Rabbi Joseph Raksin hy''d of the neighborhood, who was shot to death on a Saturday as he walked to a local synagogue in Miami, Florida.